If we would despise the enemy, our thoughts must always be of God and our souls always glad with hope. To those who have an active belief, reasoned proofs are needless and probably useless. 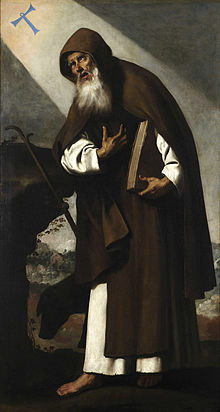 Saint Anthony the Great (251–356) was a Christian saint, also known as Saint Anthony of Egypt, Saint Anthony of the Desert, Saint Anthony the Anchorite, and honorifically as the Father of All Monks. 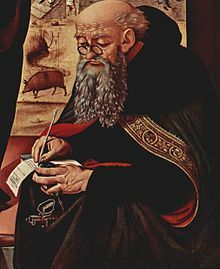 He was a leader among the Desert Fathers, Christian monks in the Egyptian desert in the 3rd and 4th centuries A.D.
To one whose mind is sound, letters are needless. I am going the way of my fathers, as the Scripture says, for I see myself called by the Lord. Be you wary and undo not your long service of God, but be earnest to keep your strong purpose, as though you were but now beginning. You know the demons who plot against you, you know how savage they are and how powerless; therefore, fear them not. Let Christ be as the breath you breathe; in Him put your trust. Live as dying daily, heeding yourselves and remembering the counsels you have heard from me. … So do you also be earnest always to be in union first with the Lord and then with the Saints, that after death, they also may receive you into everlasting tabernacles as known friends. Ponder these things, and mean them. … And now God save you, children, for Antony departs and is with you no more. Whoever hammers a lump of iron, first decides what he is going to make of it, a scythe, a sword, or an axe. Even so we ought to make up our minds what kind of virtue we want to forge or we labour in vain. This page was last edited on 28 December 2018, at 14:49.